Beam me up Scottie because it what has to be the worst miscasting of the decade, it has been “officially” announced that Orange Is the New Black transsexual actress Laverne Cox will fill the “sweet transvestite from Transylvania” role made famous by Tim Curry in an upcoming FOX -TV’s version of The Rocky Horror Picture Show! High School Musical’s Kenny Ortega will direct, choreograph, and executive produce. Which really about says it all. Well on the bright side at least this still means I have a chance of playing Mama Rose in “Gypsy” on day. How do you like THOSE eggrolls Mr. Goldstone? 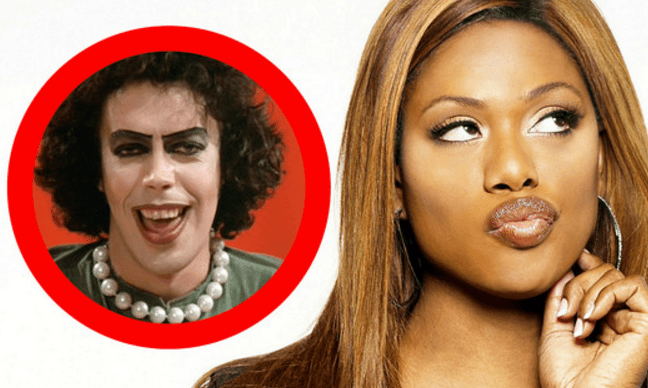 #WrongOnSoManyLevels FOX Laverne Cox Oy Gavalt Rocky Horror Picture Show stunt casting Sweet Trangender? Gay Geek News – Dr Who, Diana Rigg and Jennifer Saunders. BLIMEY! Oh Will… you think you know us so well. Wait until you read my upcoming op-ed on the topic for the Advocate.